The question is being raised all over Silicon Valley — and increasingly around the world — if biotechnology is essentially a branch of information technology. 3D printing is one of those technologies that tests the boundaries between the digital and the physical worlds. Consider the images above you. On the upper left, an algorithm. On the upper right, something alive. Yet eerily similar. Images of ferns and leaves? Well, no. None of these are real. They’re just a bunch of 0s and 1s. 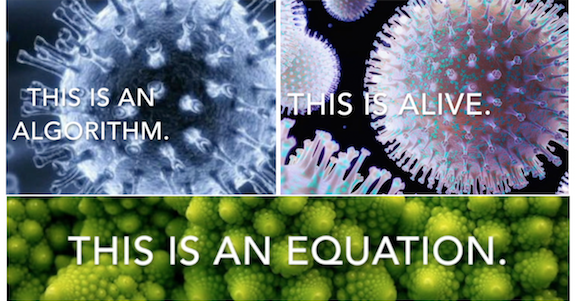 Where does math end, exactly, and life begin? Investors, theorists, entrepreneurs are forming a thesis that profound improvements in the physical world are going to come because of radical improvement in the flow, handling and interpretation of information. And the branch of synthetic biology known as computational design is the bleeding edge of that. “We have only started to scratch the surface of what synthetic biology can deliver,” Arzeda CEO Alexandre Zanghellini told The Digest. We call this new field Digital Biology. There’s nothing synthetic about it — this is about real, living, things with extraordinary precision of design, entirely grounded in computation and the digital revolution. Already, advanced protein design technology can deliver revolutionary new production pathways for a wide range of valuable chemicals and materials, including many that have previously been impossible to produce. And you thought that IKEA designers were clever because they revolutionize what you can make of a 600 square foot living space. Now along comes a string of Digital Biology companies whose designers are using automated CAD design platforms — originally developed to assist in the design of rooms and buildings — to revolutionize the design of proteins and metabolic pathways. “The list of markets that will be touched by these innovations is long, from agriculture and advanced materials, to specialty chemicals and pharmaceuticals,” Zanghellini added. Another wave of progress is imminent on that front as several of these companies have been raising gobs of cash. The latest and perhaps most interesting of these? Zanghellini’s company, Seattle-based Arzeda. Last month, Digest and Nuu readers voted the company #6 in the 40 Hottest Emerging Companies in the Advanced Bioeconomy. Not least because of recent hook-ups like the TeselaGen deal. Apparently, venture investors agree. Arzeda closed its Series A funding round with an oversubscribed total investment of $15.2 million. News of the initial $12 million first close arrived in July — but Universal Materials Incubator Co., Ltd. (UMI) and Casdin Capital, LLC joined with another $3.2 million. They join OS Fund and Bioeconomy Capital, Sustainable Conversion Ventures, and Arzeda’s seed investor, WRF Capital as series A investors and Co-Founder and General Partner at OS Fund, Jeff Klunzinger, has joined the Arzeda board. It’s impressive. The company has already developed proteins for global manufacturers, such as DowDuPont, Mitsubishi Chemical, INVISTA and others to improve crop yield and resilience, increase the performance and sustainability of advanced polymers, reduce the cost of producing high-value food ingredients, and more. Arzeda has two special pieces. Its Archytas industrial protein design software and Scylax computational pathway design tool. The software platform and design tool are used to identify and design new enzymatic pathways capable of producing molecules that are impossible to synthesize via conventional chemistry. These pathway designs are implemented and tested by Zymergen’s high-throughput strain development and testing platform. The Series A funding will expand the throughput capacity of Arzeda’s proprietary protein design platform and product development pipeline, with a focus on delivering novel proteins and biological pathways that are ready for commercial production. We covered Arzeda here: Engage the hyper-drive: Synbio’s fastest are going faster, bigger as Kytopen, Ginkgo, Twist Biosciences, Arzeda, TeselaGen feel the need for speed. As reported in the Digest in November 2016, Arzeda reached a major technical milestone with Amyris as a part of a Defense Advanced Research Projects Agency (DARPA) Technology Investment Agreement. Arzeda’s high-throughput, automated pipeline for protein engineering and pathway discovery was validated by the production of two keystone molecules which was further optimized by Amyris. These two molecules are industrially important as dyes, food ingredients and pharmaceutical intermediates, but their current manufacture involves the use of highly toxic and carcinogenic substances such as cyanide and benzene, which presents occupational health hazards, is energy-intensive and leads to environmental damage through the discharge of toxic effluents. Under this DARPA-funded TIA, led by Amyris, Arzeda has been developing a high-throughput automated pipeline for the computational design of novel enzymes and pathways for the production of novel molecules in a variety of fermentation hosts. As we reported in March 2016, Zymergen and Arzeda signed a multi-year agreement to develop strains and processes to manufacture novel, high utility molecules and materials utilizing Arzeda’s pathway and enzyme design and Zymergen’s strain construction capabilities. Where does math end, and life begin? More about all those 0s, 1s and life itself, here in The Yottabyte, Hyperspeed Economy, and you.